Book a romantic Bora Bora vacation for 50% OFF! 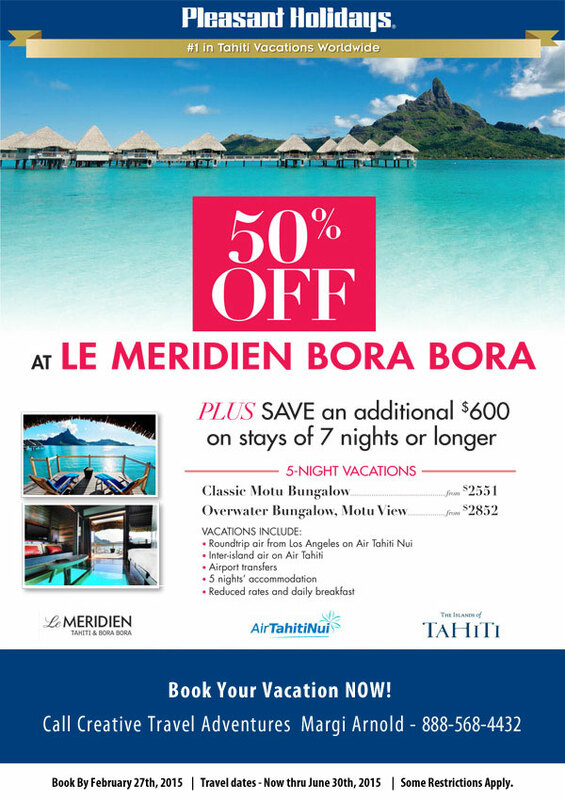 Le Merdian Bora Bora offers a combination of outstanding bungalows and villa suites: beautiful Beach Bungalows, Classic Motu Bungalows and the most romantic Overwater Bungalows featuring a large glass floor with amazing views of the lagoon and its marine life. All bungalows have chic and modern furniture, full facilities and the flavour of the Polynesian culture. For delight cuisine and culture, the hotel recommends its “Le Tipanié” restaurant offers mouth-watering buffets for breakfast and dinner. Themed dinners and fresh tropical fruits charm guests of all backgrounds joining Polynesian and international flavour, its lovely decor with sandy bottom floor at the restaurant “Te Ava” or our new opening “La Trattoria” restaurant which offers you a charming escape way to Italy every evening through its offer of freshly “upon request” made pasta. Book by Feb 27th, 2015 and travel now thru June 30th, 2015. Call Margi Arnold at 888-568-4432!